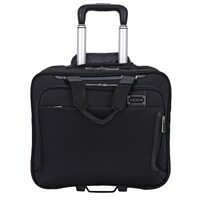 Tech Exec Rolling Case Fits up to 15.6in + Ipad/Tablet PocketPremium design will accommodate laptops up to 16.1". Dedicated tablet/iPad compartment, Vertical & Horizontal front zippered pockets will accommodate your valuables and is easy to access. Front workstation includes: key fob, padded cell phone pocket, pen/pencil holders, additional padded accessory pocket along with business & credit card holders. Premium design will accommodate laptops up to 16.1". Dedicated tablet/iPad compartment, Vertical & Horizontal front zippered pockets will accommodate your valuables and is easy to access. Front workstation includes: key fob, padded cell phone pocket, pen/pencil holders, additional padded accessory pocket along with business & credit card holders.